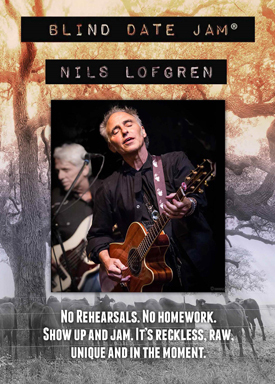 Nils has autographed copies of this limited-run DVD especially for us, and we're fulfilling orders now. Thanks to all who pre-ordered! Blind Date Jam is an 80-minute impromptu jam session that we recorded to capture the magic of the moment at Cattle Track gallery in front of a small group of friends. 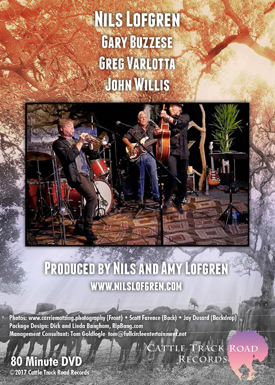 Featuring Greg Varlotta on guitar, keys, trumpet, trombone and tap dance, Gary Bruzzese on drums, and John Willis on bass. You'll see me presenting ideas on the spot, talking through the chords brießy and launching in to each piece. It's primitive, rough and inspired jamming that I feel and hope as music fans you'll enjoy. Amy designed a beautiful southwest set for us to play on and produced the adventure with me. I hope some of you decide to check it out.